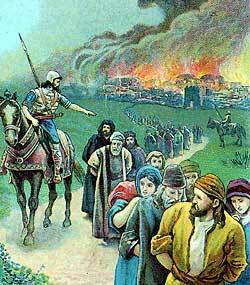 The Chaldean army marches the Jews as prisoners to Babylon. WHEN THE CITYof Jerusalem was finally broken up, the Chaldean army started back on their long journey to Babylon. They took with them Zedekiah, the king of Judah, and a host of his people for prisoners. Old men and women, young people, and even children were among the number who marched as prisoners to Babylon. Day after day this host of people walked on and on, stopping only at night to camp by the roadside and rest from their weary journey. And at every camp they knew they were farther away from their home and nearer the land of strangers. The captives were called “Jews” — a word that means “the people of Judah.” And the Jews of today are descendants of those very people who marched as prisoners from Jerusalem to Babylon so long ago. When at last the weary journey came to an end, the Jews found that their new ruler treated them more kindly than they had hoped. He gave them fields and houses in that strange land, and permitted them to work for themselves just as they had done, in their own country. He even took some of them into his capital city and trained them to become his nobles and rulers. God did not forget the people after they were carried away to Babylon. He sent messages to them from this faithful prophet Jeremiah. And he promised to bring them back again to their own country if they would try to please him while they were living among strangers. The people listened to these messages, and some of them rejoiced to hear Jeremiah’s letters read. They longed for the time to come when they would return to the land of their fathers. In the land of Babylon the Jews refused to worship idols. They saw around them the idolatry of their heathen neighbors, the Chaldeans; but they remembered how God was displeased with idol-worship, and they were trying now to please him. They often met together in little groups and talked about the land of Judah and the beautiful temple of the Lord, which had been destroyed. And when they talked about these things they wept for sorrow. Sometimes the Chaldeans would ask the Jews to sing for them. Perhaps they had heard that the Jews were lovers of music, and were skilled musicians. But the Jews hung their harps away and refused to sing. They thought the beautiful songs of joy and victory that David and other musicians had written would sound out of place in a strange country. Now the Jews were careful to teach their children about the true God. They were glad when the priest and the Levites came to talk to them about Moses’ law. And as the days and the years passed by they did not forget the hope which Jeremiah had given them–the hope of returning again to Judah. In the land of Babylon another man began to hear messages from God and to speak those messages to the people. This man was Ezekiel, who was one of the captive Jews. He had been among the first captives, when Jehoiachin was taken to Babylon. And he afterwards warned the other people in Judah about God’s punishment upon them for their disobedience. Ezekiel saw wonderful visions from God, and he encouraged the people to believe that the time would come when they might return again to their own land.